11 Paralympic Gold Medals, 6 times winner of London Wheelchair Marathon. Now retired, Tanni still plays an active role in the administration of sport. Amongst other positions she is a consultant to the 2012 Organising Committee, a Laureus Sport for Good Foundation Trustee, non-executive director of UK Athletics, on the board of Transport for London and is an International Inspiration Ambassador for UNICEF. 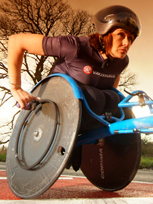 In 2005 she was made ‘Dame’ Tanni Grey-Thompson DBE for her services to sport, while in 2010 she was elevated to the House of Lords as a “people’s peer”. With specialist interest in sport, disability, health and youth development she sits on the crossbenches, bringing a wealth of experience and authority to the House. Tanni speaks about dedication, achievement and fun.